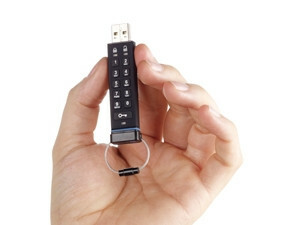 The DatAshur 4GB encrypted flash drive is absolutely secure and tamper proof, but a little costly. We all know how easy it is to lose a flash drive, and with the tightening regulatory controls on data storage, there could be dire consequences if a lost drive houses confidential or sensitive business data. However, iStorage says it has the answer - the DatAshur drive uses a combination of hardware encryption, a physical keypad and tamper-proofing technology to make it almost un-hackable. It features PIN code access and employs military grade AES 256-bit hardware encryption. The drive comes in 4GB, 8GB, 16GB and 32GB storage capacities. Encryption is authenticated by a PIN, selected by the user, and entered via a keypad on the actual drive, which is fitted with a battery that charges automatically when plugged into a USB port. All drivers needed are automatically downloaded the first time the drive is plugged in, taking only minutes. The drive also comes with an instruction manual, as well as a small, hard instruction sheet on how to get started, and how to change the password. The DatAshur needs no specific software, and will work on multiple operating systems. To unlock the drive, the user must punch in a seven- to 14-digit code, and I must say, having longish nails helped here, as the buttons are small and close together in order to fit on the drive. It must be very tricky for big man hands to successfully enter the code. The use of a keypad on the actual drive renders it secure from keyloggers. Unplugging the drive will automatically lock the PIN, and you'll need to enter it again to use the drive. Entering the incorrect PIN more than 10 times will erase the contents from the drive - very useful for stopping brute-force hacks. Speed: Up to 27MB per second read. Up to 24MB per second write. It is also very simple to change the password: two status lights - one green and one red - guide you through the process, and let you know if the change has been successful. A bright blue light will show when data is being added to, or taken off, the device. The DatAshur can also be configured with independent user and admin PINs. Should a user forget the PIN, the drive can be unlocked using the admin PIN, which will then clear the old user PIN and allow a new PIN to be set. It also has a 'drive reset' feature, which clears both PINs, destroys the data, creates a new randomly generated encryption key, and allows the drive to be reused. The number of randomly generated encryption keys that can be generated is limitless. The DatAshur is of average size, but is a little longer than most drives to accommodate the keypad. It comes with an aluminium cover to protect against the elements, and feels sturdy and solid. At R625 for the 4GB version, it is a little pricey. It claims to be water-resistant, too, and comes with a very sturdy woven metal cable for attaching to a keyring or whatever is preferred - a major improvement on the usual piece of string that looks about as sturdy as dental floss. The device is also tamper-resistant, self-destructing in the event of a thief trying to physically pry open the unit to get at the data. All in all, I liked the DatAshur. It feels solid, can take a bit of manhandling, and definitely does what it claims to do, which is keep your data secure. For those not on a budget, I'd say it's a definite winner.